A true toad is any member of the family Bufonidae, in the order Anura (frogs and toads). This is the only family of anurans in which all members are known as toads, although some may be called frogs (such as harlequin frogs). The bufonids now comprise more than 35 genera, Bufo being the most widespread and well known. Song of Common toad or European toad, Bufo bufo. 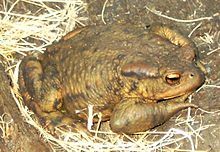 True toads are widespread and are native to every continent except Australia and Antarctica, inhabiting a variety of environments, from arid areas to rainforest. Most lay eggs in paired strings that hatch into tadpoles, although, in the genus Nectophrynoides, the eggs hatch directly into miniature toads. True toads are toothless and generally warty in appearance. They have a pair of parotoid glands on the back of their heads. These glands contain an alkaloid poison which the toads excrete when stressed. The poison in the glands contains a number of toxins causing different effects. Bufotoxin is a general term. Different animals contain significantly different substances and proportions of substances. Some, like the cane toad Rhinella marina, are more toxic than others. Some "psychoactive toads", such as the Colorado River toad Incilius alvarius, have been used recreationally for the effects of their bufotoxin. Male toads possess a Bidder's organ. Under the right conditions, the organ becomes an active ovary and the toad, in effect, becomes female. The family Bufonidae contains about 500 species among 38 genera. ^ a b Zweifel, Richard G. (1998). Cogger, H.G. ; Zweifel, R.G. (eds.). Encyclopedia of Reptiles and Amphibians. San Diego: Academic Press. pp. 91–92. ISBN 978-0-12-178560-4. ^ "The IUCN Red List of Threatened Species". IUCN Red List of Threatened Species. Retrieved 2019-01-19. ^ Brown, Federico D.; Del Pino, Eugenia M.; Krohne, Georg (December 2002). "Bidder's organ in the toad Bufo marinus: Effects of orchidectomy on the morphology and expression of lamina-associated polypeptide 2". Development, Growth & Differentiation. 44 (6): 527–535. doi:10.1046/j.1440-169X.2002.00665.x. ISSN 1440-169X. "Amphibian Species of the World 5.1 - Bufonidae". Archived from the original on 2012-07-15. Retrieved 2008-04-10. Look up toad in Wiktionary, the free dictionary.